Doctor Peter Glidden, in an interview discussing the logistical and economic corruption involving cancer, makes it clear that the connections are irrefutable. He specifically spoke of a 12-year study that began in 1994 that operated as a meta-analysis of adults diagnosed with cancer worldwide. The study, which was published in the Journal of Clinical Oncology, resulted in finding that, chemotherapy does not work 97% of the time. 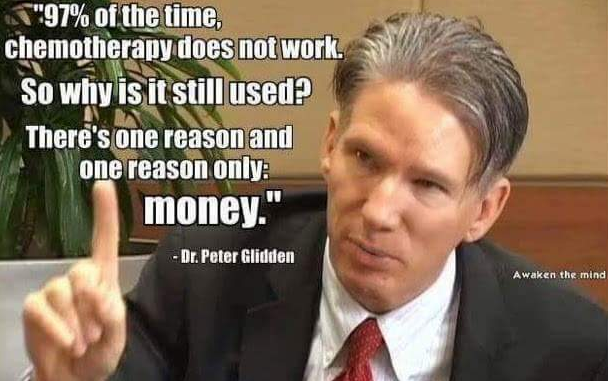 Which then brought Glidden to his most profound point, surrounding the question as to why chemotherapy is still the go-to in modern medicine for cancer patients, “the reason is money”. “Chemotherapeutic drugs are the only drugs that the prescribing doctor gets a direct cut of” Chemotherapy is often the first step in enhancing the longevity of life for the patient. However, alongside the tedious and physically-depleting radiation sessions are the medications prescribed concurrently with the treatment. These pills cost approximately $12,000 for the patients and insurance policies tend to only pay up to $8,000 of the bill. The doctors take home the difference and net a comfortable profit after paying $5,000 for the pills from the pharmaceutical companies themselves. This issue of moral obligation and financial reward could certainly be considered one of the staples behind the driving force in which medical professionals continue to advise and prescribe these drugs. Although Glidden takes the opportunity to market his book, in which he offers ten questions for every cancer-diagnosee to ask their doctors. He said that doctors had reportedly thrown patients out of their office for asking some of these questions and that he found it particularly interesting because the questions are rather rudimentary and all focus on information that the patient has every right to know. What does this say? It tells us exactly what we already know, the medical sector of our economic system is run similarly to Wall Street, based upon financial gain and, good business. This shouldn’t come to a surprise to any of us, remember when Martin Shkreli raised the price of AIDS medication over 5,000% and then recently purchased Wu-Tang Clan’s private album for $2 million. Medical professionals have thrived in the open market by price gauging not only medication but medical supplies as well. 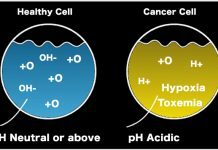 Yet, Glidden doesn’t simply reprimand the current situation but offered that if we, as a society, implement more holistic practices, as he believes cancer is a dilemma of holistic origin. 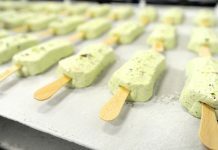 He offers that if women took 200 micro-grams of selenium would drop breast-cancer diagnoses, in the matter of a single generation, by 82%. These numbers are staggering and demonstrate the value of treating a holistic-based illness, with a holistic solution.